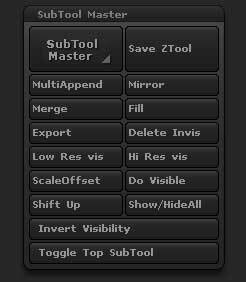 SubTool Master is a plugin designed to simplify many operations involving SubTools. It also includes checking mechanisms to help avoid common mistakes that can arise when working with SubTools. This button launches SubTool Master’s pop-up interface. 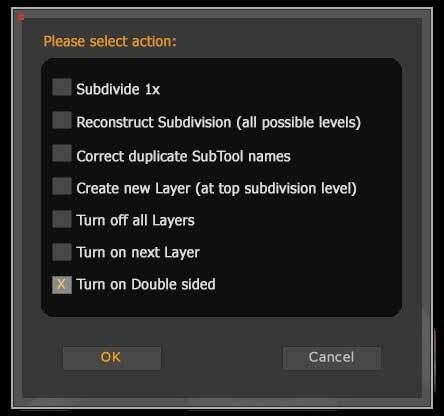 All features for the manipulation of SubTools are available through the pop-up interface, or through the buttons in the SubTool Master sub-palette. One very helpful feature is that you can assign a hotkey to this button for instant access while you work. To assign a hotkey, hold down the Ctrl button and click on the SubTool Master button. Your next keypress will assign that key as a hotkey. Be sure to save your hotkey modification by using the Preferences:Hotkeys:Store button. This button saves the currently-selected model as a ZTL. In order to avoid potential problems with the save, it always saves from the top SubTool and also gives a warning message if the model contains any hidden points. After saving the model, it then returns to whatever SubTool was selected at time of save. As with the SubTool Master button, you can assign a hotkey to this feature. Using the hotkey will give ‘Save’ functionality so that the last used file name is used and the Save As dialog is bypassed. The MultiAppend button allows you to append OBJ or ZTL files from disk to the current tool. Pressing the button will launch an open file dialog. By Shift+ or Ctrl+selecting files you can append several files at the same time. If a ZTL has more than one subtool then all subtools will be appended. 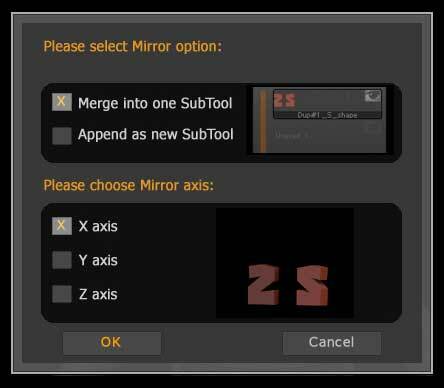 The Mirror button will mirror the selected subtool. An options dialog will appear, allowing you to control the mirroring operation. 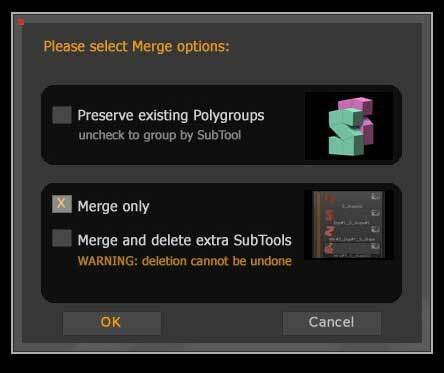 The Merge button will merge the visible subtools. An options dialog will appear, allowing you to control the merging operation. 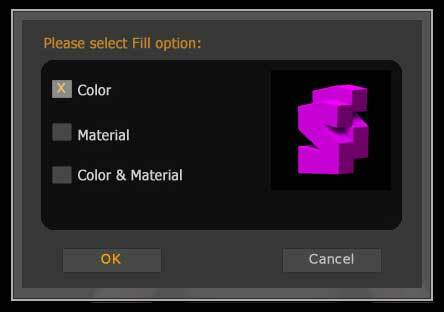 The Fill button will fill the visible subtools with color, material or color & material. An options dialog will appear, allowing you to control the filling operation. Additionally you can use the Fill option to turn Colorize on/off for the visible SubTools by clicking the icon in the dialog. When the icon is colored then Colorize will be turned on and any Polypaint will be visible. When the icon is gray then Colorize will be turned off and any Polypaint will be hidden. 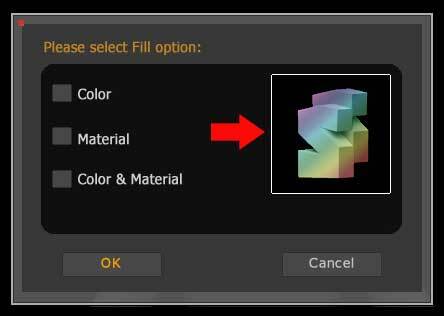 Note that this option can’t be used when you want to fill with color or material and those options will be automatically turned off. The Export button will export the visible subtools. An options dialog will appear, allowing you to control how the subtools are exported. The Delete Invisible button will delete all subtools that have their eye icon turned off and so are not visible. Note that the selected subtool is not deleted, whatever the state of its eye icon. The first time this option is run you will get a ZBrush warning message that this operation can’t be undone. You should click the “Always OK” button to avoid seeing this message again. The Low Res visible button will set the visible subtools to their lowest subdivision level. This is similar to the All Low button in the Tool palette except that it only changes the visible subtools. The Hi Res visible button will set the visible subtools to their highest subdivision level. This is similar to the All High button in the Tool palette except that it only changes the visible subtools. The ScaleOffset button will set the Tool>Export Scale value to 1 and the Tool>Export Offset values to 0 for all subtools (invisible subtools are included). The DoVisible button will show a dialog with a selection of options. 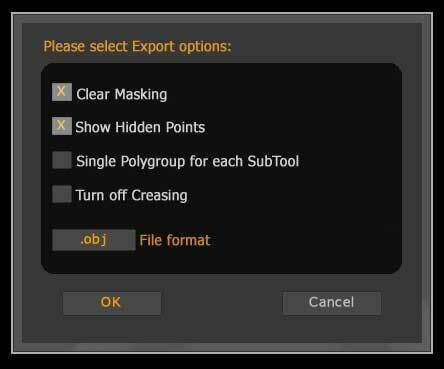 Selecting an option and pressing OK will apply that option to the visible subtools. The Shift Up button will move the visible subtools to the top of the subtool list. This can be useful when working with a particular group of subtools at a time. Note that the top subtool is not moved. The Show/HideAll button will show or hide all the subtools. Unlike the Solo button, the currently visible subtools are kept visible. For example, if you have three subtools visible then one press of the Show/HideAll button will show all the subtools; a second press will show just the original three subtools. The Invert Visibility button will make all visible subtools invisible and show those subtools that were hidden. The selected subtools will not be affected and remain visible. The Toggle Top SubTool button will switch the visibility of the top SubTool on or off while you work. This makes it easy to quickly check your work progress against the top SubTool. You can assign a hotkey to the button if you wish. Of course, this will only function if your model has multiple SubTools and a SubTool other than the top one is selected.